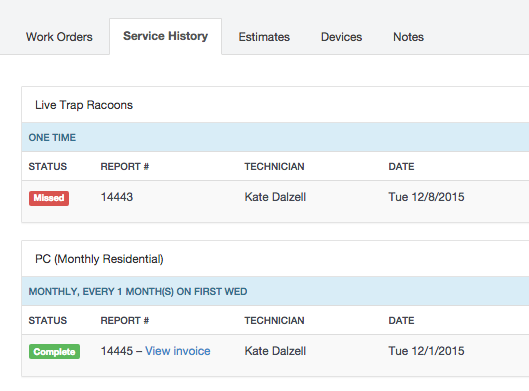 UPDATE – We recently re-organized how work orders are displayed in your customer’s accounts. 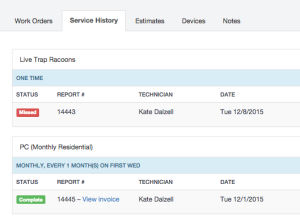 Now, the Service History tab contains only work orders with a status of Complete or Missed and is no longer date sensitive. Prior to this update, this list/tab was driven by date and contained all work orders that were ‘in the past’ or dated prior to the current day--regardless of status. If you have created custom reports in your account, your report may not have these updates. You may need to recreate new-custom reports for yourself or your team. UPDATE – The Sales Commission Report received a bit more attention this week. We added in the Service Type Description and a default display to view of ALL completed work orders, not only the work orders with assigned commissions. We have also removed the default groupings, allowing you to sort the report by clicking each column heading. Additional improvements include a new filter to view all work orders with NULL users assigned and direct links to both the associated Work Order and Invoice for immediate editing. UPDATE – Filter for aging period Current Unpaid has been added and all aging period filters are working properly. Features to look forward to on this report is the ability to bulk email and print customer statements that meet specific criteria like: Customer Name, Customer Type, and Aging Period. UPDATE – The technician’s actual Start Time and End Time + a calculation for total worked minutes is now on this report. By using the filters to narrow down a specific date, week or month paired up with the filter for the specific tech, you can eliminate the countless hours you spend adding up the hours worked on pay-day. UPDATE – When searching through your Company’s Audit Trail report – you will now see that we’ve added the associated Work Order for a Deleted / Destroyed invoice. This is a linked number — allowing you quick access to the details behind the deleted document.